This new lamp can be filed under all that is bizarre and the slightest bit creepy. 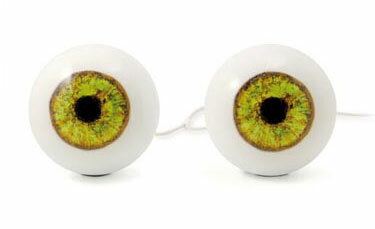 They are hand blown glass and made to look exactly like your eyes. So if you’re a bit full of yourself when it comes to your eye color, now you can show it off through a bit of quirky lighting. Although I imagine your guests would feel the slightest bit unnerved by sitting next to a set of lamps that keep staring back at them. So just depending on how much you actually like your friends, you might not want to keep something like this around. To get your own set custom made for you, you will have to take close up shots of your eyes. Then pick out a color that matches the shade of your eyes. These are made by Livio Serena who works out of Murano. Each pair is going to obviously be created made to order, so its not something that can be rushed out. You will need to contact 5.5 Designer to get the pricing info and availability on this product.